Wow, mom!! Look, dad!! You get 100 soldiers in a FOOTLOCKER!!! [Yes, there were that many exclamation points and large bold letters in his voice]. There is a fine, perilous (potentially costly in therapy) line between indulging a sense of what-if & starry-eyed innocence and dashing a boy's dreams with the sledgehammer of reason. Yes, this does look like an exciting proposition - durable plastic, each with its own base; they even include WAVEs & WACs - how can a good mom keep such a quality, feminist-forward toy out of her kid's hands? Yet. Chances are mind-bogglingly high that this company is no longer around and even so, the FOOTLOCKER is smaller than a tampon box (I didn't use that example though; see 'potentially costly therapy'). We did, however, look up Lucky Products, Inc and got as far as this product of too much time on someone's hands. 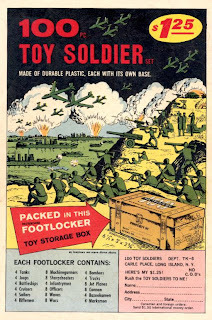 Alas, no footlocker full of army dudes via mail order but plenty of info on what happens when boys are allowed to hang out in their parents' basements for too long the amazing world of comic book toy soldiers. Mason lamented that he was born too late; it would have been so awesome to live 'back then' (1981) and be able to get his hands on these toys. But today, there was a new discovery (again in the pages of an ancient comic book; what is wrong with me, letting them in the house?). If ever you spent a childhood afternoon lost in the misadventures of Archie & friends, surely you know what's coming. X-Ray Vision glasses, anyone? How about the coveted Slot Machine Bank? Midget camera? My kid was so absorbed in every novelty on this page, he could hardly sit still. Oh! A Giant Puppet Eagle! Hey! A Motorized Submarine! Oh MAN, A SquirtLighterSmokeFromYourFingertipsBlackEyeJokeDeluxeRevolvingPoliceStyleWarningLightOnly$7.95! THESE ARE SO COOL! Because the last round of mania ended pretty well (we couldn't possibly get the $1.98 Toy Soldier Set and it was not my fault), I offered to look up Johnson Smith Company. Well, whaddya know? Not only still around but apparently going strong and offering the same crap to a new generation. Big sigh from me, a resounding HURRAH from the boy. I could hear the calculator in his mind whirring through allowances for weeks to come. I am not looking forward to putting the kibosh on Sea Monkeys. You would so enjoy the new Billy Bryson memoir, "The Life and Times of the Thunderbolt Kid." Sheer nostalgia. Jenn's right, you would love the Bryson book! I just wrote about Sea Monkeys last week -- http://jenontheedge.wordpress.com/2008/06/30/sea-monkeys/ -- and I can't tell you how much fun I had reliving my childhood fantasies. oh i so remember those comic ads! remember the one ad for charles atlas? i was amazed that anyone would want to kick sand at someone else. how silly. i always pictured some geeky boy going "yes, they always kick sand at me. i'm gonna make them pay. MAKE THEM PAY!" I remember all those comic book ads! I ALWAYS WANTED the x-ray glasses! My brother and I had the little army dudes that you can buy in a bag in the toy aisle at the supermarket...we used to set up all sorts of war scenes and they were so much fun! We are currently watching 'National Lampoon's Vacation'...and sharing the memories with our 12YO. She's been on a kick where she likes to hear the music that I listened to at her age. She LOOOOOVES Cyndi Lauper and Run DMC!!! My local dollar store carries midget digicams, and I would be more than happy to pick one up. If you need one. For like a gift. Or something. Oh those ads. I was always very mesmerized by the sea monkeys. I loved that little family. I wonder how many little boys & girls were disappointed by the arrival of the long-awaited army dudes or x-ray glasses or any of the other stuff offered in those comics. Ah, the halcyon days of the 1980s. Ages ago! These gadgets always remind me of A Christmas Story and the "drink more Ovaltine" scene.